For the third year in a row, Bay Area drivers traveling into San Francisco across the Bay Bridge will be greeted by a familiar sign on Treasure Island. 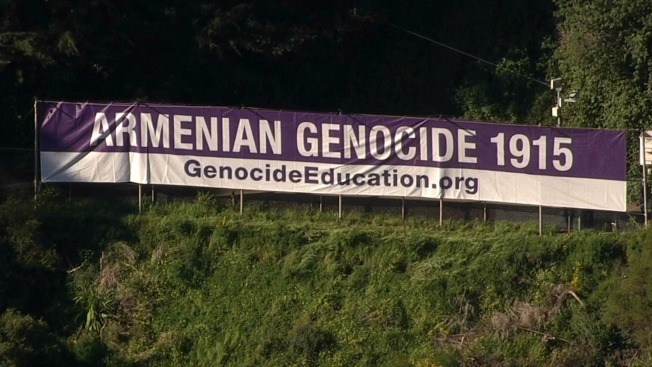 The banner, which is hanging above the tunnel on the eastern side of the bridge, reads "Armenian Genocide 1915" with a link to GenocideEducation.org. The sign is designed to raise awareness about the roughly 1.5 million Armenians who were killed by the Ottoman Empire more than one century ago. The Turkish government still does not recognize that the genocide occurred, prompting local Armenian community leaders to reignite a discussion about the historical event. "What I would like people to do is to just give it a thought about how they can prevent genocide, how they can recognize genocide and how they can educate themselves about what has happened," community leader Alex Bastian said. Roughly 30,000 Armenian community members in the Bay Area contributed to pay for the banner, which will remain in its place for the entirety of April. "It's great for people to see the banner for the whole month of April on the bridge because it brings awareness and will spark interest and that's what we want," community leader Kim Bardakian said. "We want people to go to the website. We want people to see and learn about our history." NBC Bay Area reached out to the Consulate General of Turkey in Los Angeles — the closest to the Bay Area — but has yet to receive a comment.